Just when you think you have cracked the subscription box phenomenon, you realize that there is competition all around, and is catching up to you like the plague. Gone are the days when you can dangle the outfit Gigi Hadid wore in New York Fashion week, or its lookalike, and expect sales to shoot up. Gone are the days when you can send out questionnaires, make phone calls and chat up your customers to understand what colors and styles they fancy. Independent retailers might seemingly have an edge from big-box retailers, due to their ability to establish stronger relationships with their smaller consumer base & curate thematic outfits for lower logistical costs as well as keep their churn rates low, but even the most successful of the lot – including Ipsy, Dollar Shave Club, Home Chef and Birchbox – all saw lower visits over the last year, according to Hitwise (Forbes). But what is the buzz around the subscription box model in the first place? The subscription box business model can be lucrative. Bonding with shoppers through subscription services, keeping them engaged with exciting new offerings can be a great way to foster customer retention. The subscription box market has seen a growth of 100% in the last five years, acting as one viable solution to boost customer retention by providing convenient, personalized and sometimes lower-cost ways to shop. The largest such retailers generated more than $2.6 billion in sales in 2016, up from a mere $57.0 million in 2011. For those who subscribe, a study by McKinsey and Co., found that nearly 35 percent have three or more active subscriptions while 15 percent of online shoppers have signed up for one or more subscriptions to receive products on a recurring basis, frequently through monthly boxes. While this is an attractive way to generate a new stream of revenue for retailers today, the visit rate in the top subscription sites is down from 70% to 61% earlier this year, according to Hitwise. Competition from brands across the board, that are figuring out ways to include the subscription box model in their repertoire, are keeping customer acquisition costs and churn rates high. The expectations from retailers today are far more sophisticated in that the typical consumer – often younger, affluent urbanites – want access to personal stylists, and are quick to pounce on the next shiny fad around. Consumers do not inherently gravitate towards subscriptions, often fearing long term commitments to services that may not fully cater to their requirements. 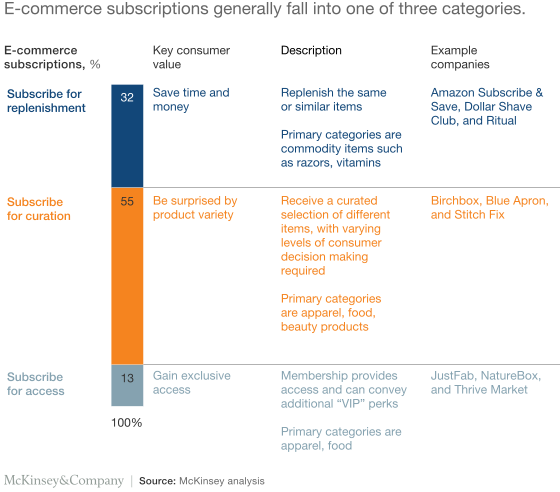 According to McKinsey and Co.’s study, only 55 percent of those who consider a service ultimately subscribe. Customer retention and acquisition can be an expensive ordeal for players in this market. A big worry for brands today is the cost of scaling their subscription box model. Most retailers charge monthly fees, with some having higher structures depending on the size of their customer base. A typical conundrum they face is how they can put a cap on the fees they charge while containing the level of churn and keeping their offerings exciting enough to maintain long term relationships. While monthly fees is often the deterrent for long term customer subscription engagements, it is also key for retailers to make a profit out of this revenue stream. According to a study by McKinsey & Co., curation services with 55 percent of total subscriptions, are by far the most popular, suggesting a strong desire for personalized services. An exception to the slowing traffic to subscription box retailers sites, is StitchFix, a styling service for men, women and kids, that personalizes outfits for their customers and sends them to their doorstep. StitchFix’s personalizing offering helped keep their churn rates at bay. A key way to keep your subscriber engaged is to keep things personal and innovative. 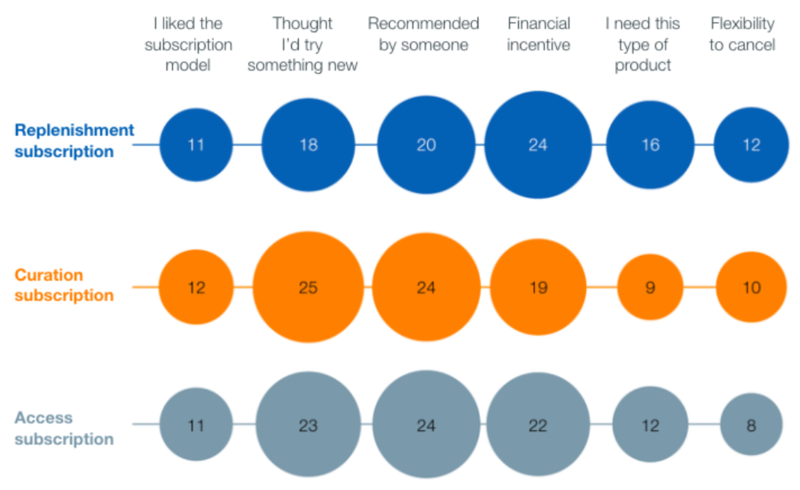 Word of mouth recommendations contribute largely to new subscription acquisitions as shown above from Mckinsey and Co.’s study, however delivering superior experiences can influence how long they plan to stick around. Consumers are quick in trying out new services, however they are just as quick to dismiss the ones they feel don’t get their vibe. The good news is, whether you are an independent retailer or a larger marketplace, you no longer need to think twice about providing experiential shopping at scale. AI – driven styling and outfitting is designed to save you the trouble of having to think and curate styles for millions of consumers out there. Your best bet is to sit back and let AI be a part of your toolkit. Here is why and how this works. If they like you, they stick around. How can retailers navigate through the logistical issues of curating personalized outfits, avoid the hassle of legacy processes like feedback questionnaires, phone calls and reduce customer acquisition costs? What does this mean for the subscription box wave of retailers? Luckily for us – visual merchandising today is a heavy beneficiary of AI – driven algorithms that can be conveniently molded to act as virtual stylists. This is not to say that it can compete with a human stylist, but instead, it enables human stylists and merchandising teams with accurate styling and outfitting suggestions, saving them time for manual outfit creation, and dealing with out of stock items. 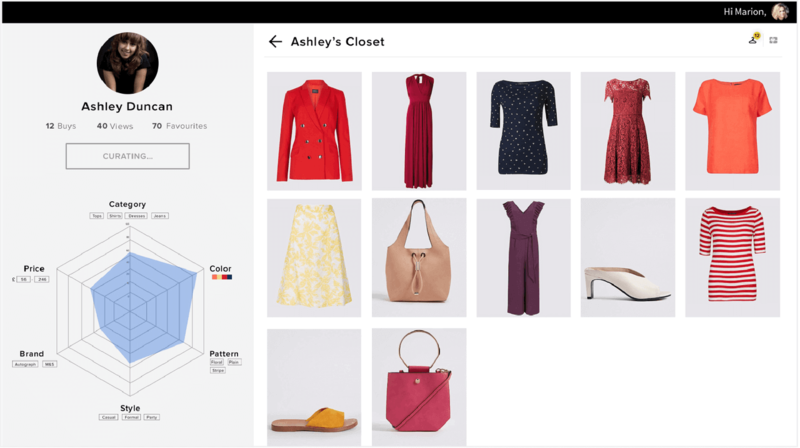 Dynamic personalization algorithms can learn from the rules of lifestyle and fashion from human stylists and lookbooks, and also forms style associations from the nuances of individual user shopping behaviour. 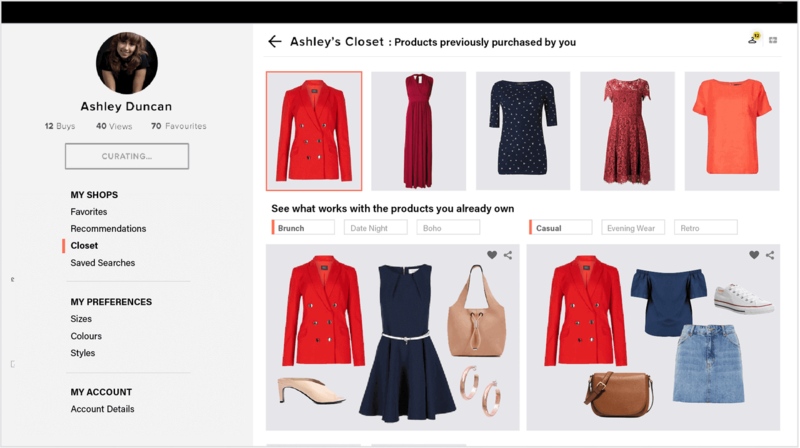 AI can understand the visual elements of any apparel, learn with every product click, scroll, page view, cart addition or any user action on a site, thus seamlessly being able to automate the process of curating personalized outfits for individual consumers. Taking a case in point – Ashley Duncan (in the image below). Ashley loves her reds and other similar color tones. She is also specific about the patterns she likes – stripes and floral for certain occasions. The web diagram in the above image indicates the learning mechanism that the algorithms use in arriving at a persona for Ashley. Taking into account some of the items Ashley has already purchased (in the image below), it becomes easier to curate outfits that she can match with what she owns. Shown are some combinations that the algorithms curate, taking into account the out of stock items. Pretty chic right? Whether you want to style your customers through doorstep deliveries, or put up a virtual stylist for individual account pages, or empower your in store associates in becoming a personal stylist on their own, Image Recognition based styling and outfitting tools can empower your brand in ways you may not have explored before. The key reason for success is the ability AI provides in being able to deliver consistently and at scale, keeping your costs low and being able to cater to large consumer bases in real- time. VueStyle is a smart solution for styling, outfitting, and visual merchandising for fashion retailers. Subscription box automation and scaling can be made effortlessly efficient with VueStyle. You can automate product selection based on customers’ style and fit preferences and use your human stylists for final approval. With advanced built-in analytics, VueStyle will get smarter with every box. 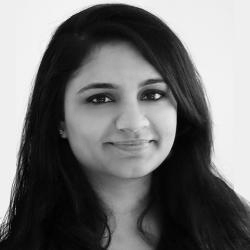 Bhavani Tirumurti is a Business Analyst at Mad Street Den. She enjoys cheese tasting and has recently discovered a passion for painting and art.